Persimmons are one of my favorite fruit. I bet one does not hear that too often, but these orange fruits really are one of my favorites. 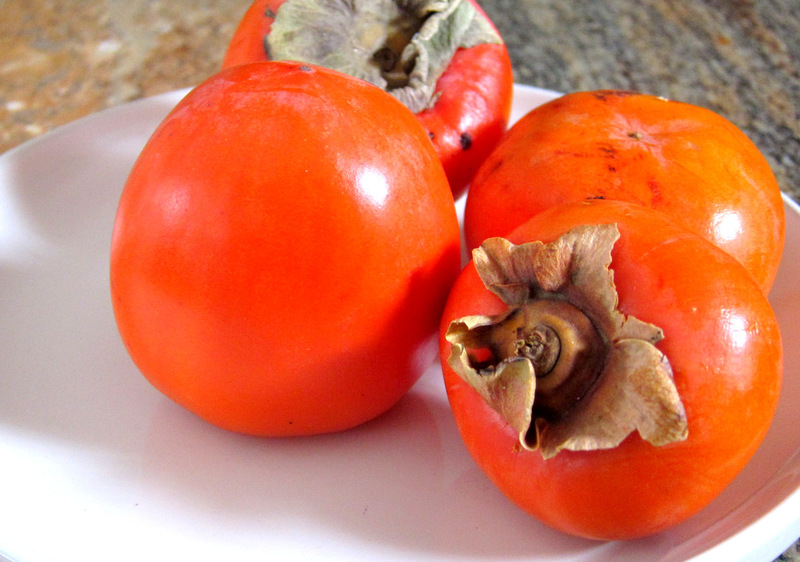 To be specific I am talking about the acorn shaped Hachiya persimmon not the squat round Fuyu one. 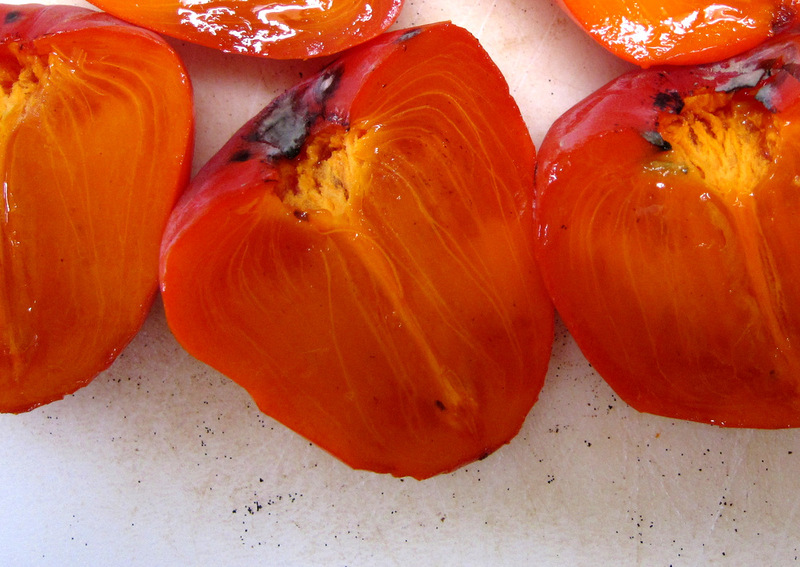 The Hachiya persimmon is very astringent and really inedible unless very soft and ripe. The flesh turns to a sort of honey flavored fruity jelly when that happens. That’s when they are perfect and sublime. I remember eating dozens of them in Lebanon during their season, usually autumn through winter. That was my excuse to make this recipe, even though Hachiya persimmons are a bit tough to find. Another reason to make this was the various techniques in there that I’ve not tried before from the complex (making carrot curry raisins using reverse spherification) to the simple (“steaming” a cake in a bag in a heat controlled water bath). 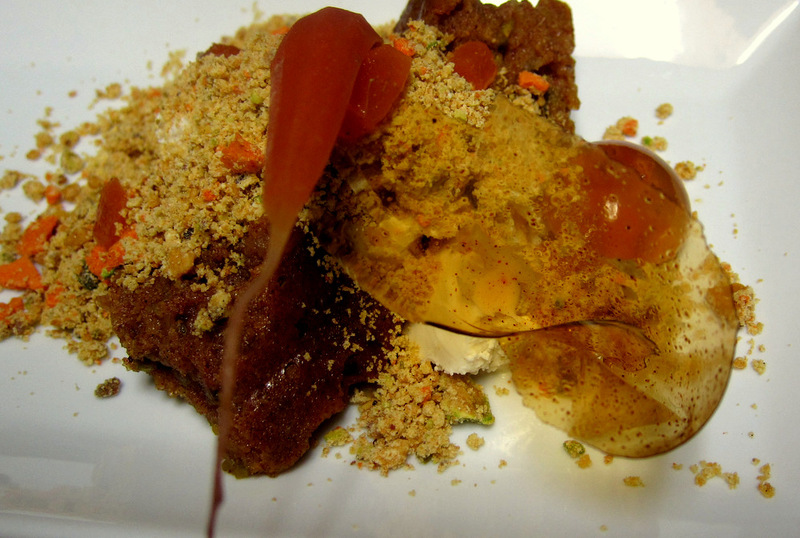 What we have here is a crumbly mix (pistachio brittle, dehydrated carrot foam, tapioca maltodextrin, pistachio shortbread) that covers a very interesting caramelized milk ice cream and a cake/pudding of persimmon. 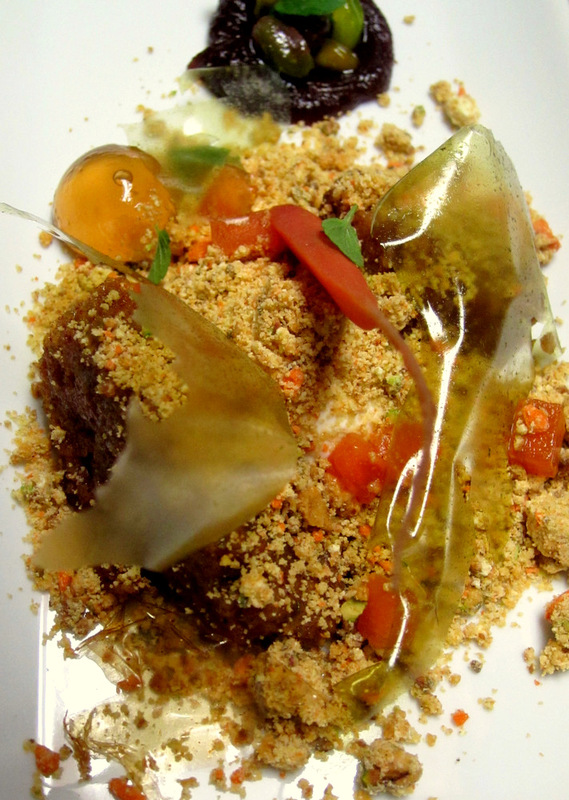 Around those main components we have glazed carrot, ginger sphere, carrot curry “raisin”, date puree, braised pistachios and two types of “films” (a spiced strip and a fennel-mint film). I first got to making the ice cream. Most ice creams in the Alinea book are not traditional in that they use less sugar than normal, little or no eggs and are designed to be used with a PacoJet machine that finely “shaves” the frozen ice cream cylinder into perfectly smooth servings. Lacking a PacoJet, I usually adapt the ice cream recipes into something more appropriate for my ice cream maker and freezer like the buckwheat ice cream that I prepared a couple of times. This time though I decided to try the recipe as proscribed to see what I come up with. I figured I had a couple of weeks before I need to serve this and if the ice cream comes out too crappy, I’ll scrap it and make another batch. The ice cream is based on caramelized milk. A combination of milk, some half and half, dried milk, very little sugar and honey go in a Foodsaver bag and are cooked for several hours. 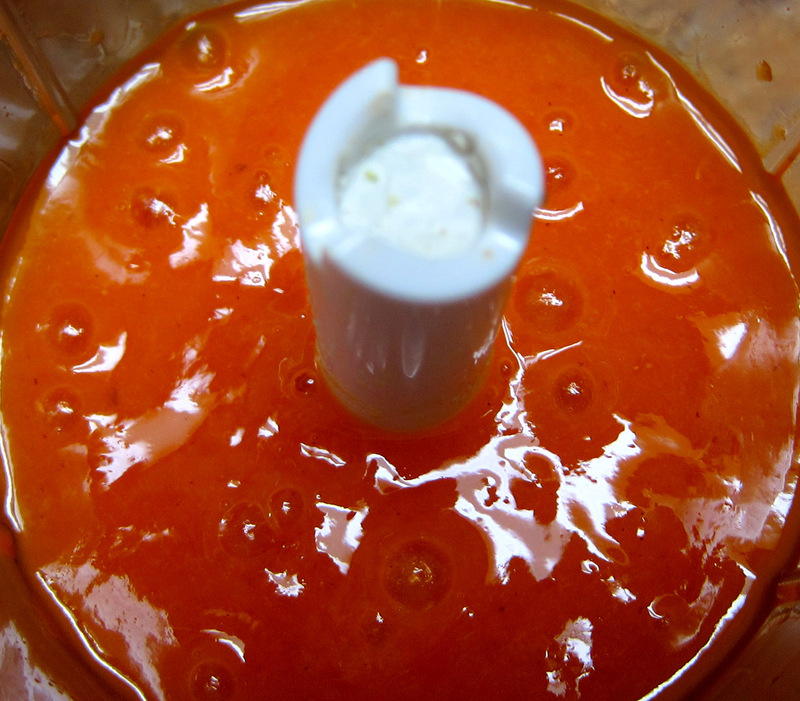 The idea is to caramelize the natural sugars in the milk turning the mixture a tan color. I was very curious how this would come up and indeed the mixture turned a light tan color but a bit lighter than I would’ve expected. After cooling, the ice cream gets churned and frozen till service time. Now, as expected from such a low sugar and relatively low fat ice cream, the texture right out of the freezer was not great. It was frozen solid and a little bit grainy. After a few minutes on the counter though the texture improved a lot. The flavor was very interesting. It is not an ice cream I would ever serve by itself. It is not sweet, very milky and has a flavor that reminded me of evaporated milk. Making The persimmon cake is pretty simple. 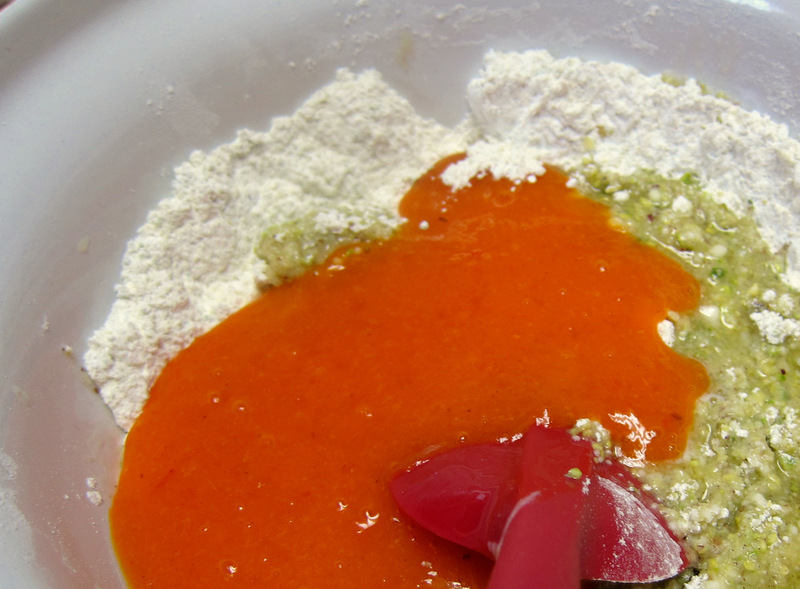 Just puree the persimmon flesh with flour, pistachio flour, sugar, eggs, butter, spices and citrus zest. 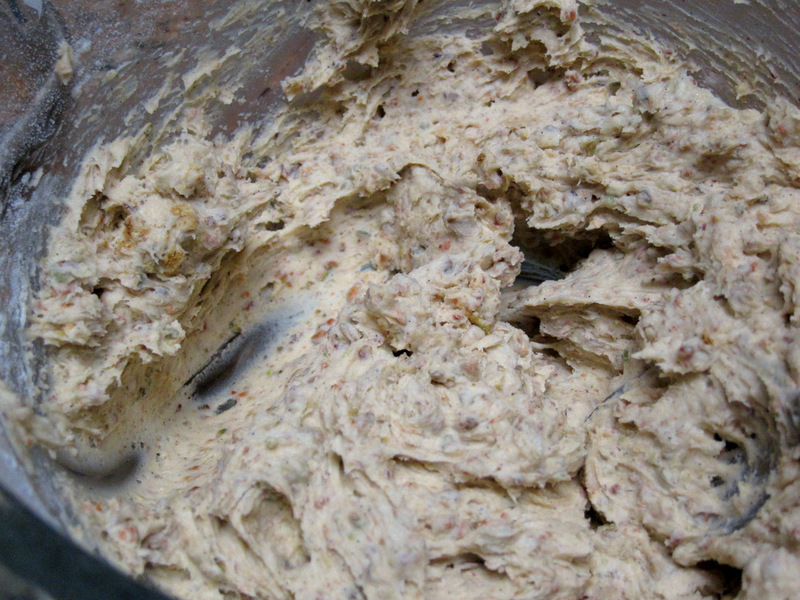 The mixture then goes in a Foodsaver bag and is cooked for a few hours in hot water. The cake is then cooled and re-warmed before serving. The taste is delicious, sweet and rich with spice and butter.The texture is a lovely mix of pudding and cake. I will certainly be borrowing this technique possibly with other flavors to make tender cakes or puddings. There are several pistachio preparations in this dish. The braised pistachios are the simplest. 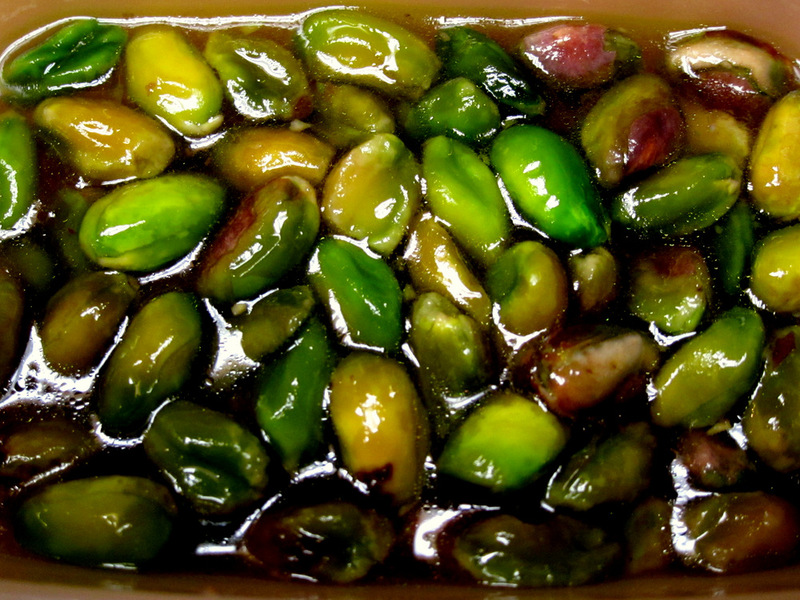 Just cook some pistachios with water, sugar and pistachio oil. Reserve them in some of the cooled cooking liquid. 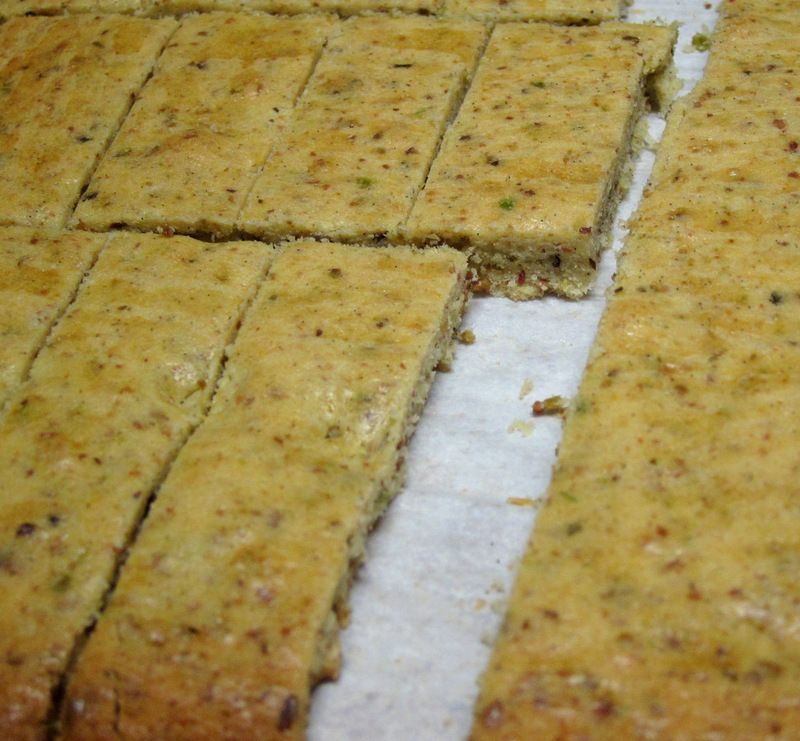 The pistachio shortbread is part of the “crumble” mixture and uses pulverized pistachios, butter, vanilla and eggs. It is then cooled in the fridge to make it manageable (it has lots of butter) and then rolled into a block and baked. The shortbread is delicious on its own and leftovers made for great coffee accompaniments for a week or two. It had a lovely pistachio flavor and a tender texture. Another pistachio crumble component is the brittle. Again this makes for an addictive and tasty stand-alone recipe. To make it, I brought sugar to the caramel brown stage and tossed in toasted pistachios and baking soda. The soda reacts with the acidic environment causing the caramel to bubble vigorously creating lots of bubbles. 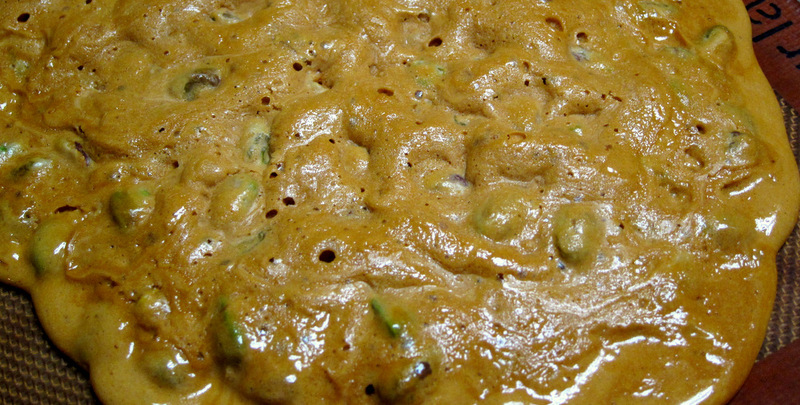 The mixture – like pistachio lava- gets dumped on a Silpat to set and harden. 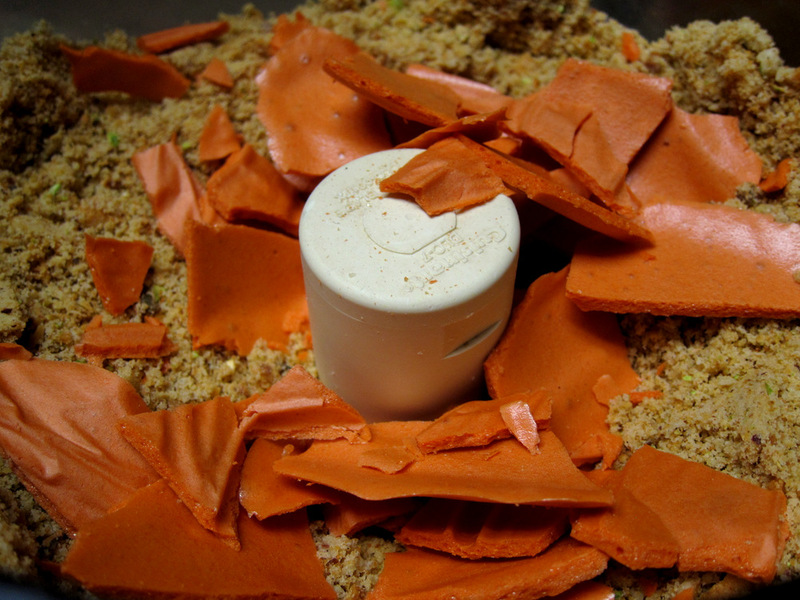 Those orange specs in the crumble mixture are pieces of carrot foam – dehydrated carrot foam. 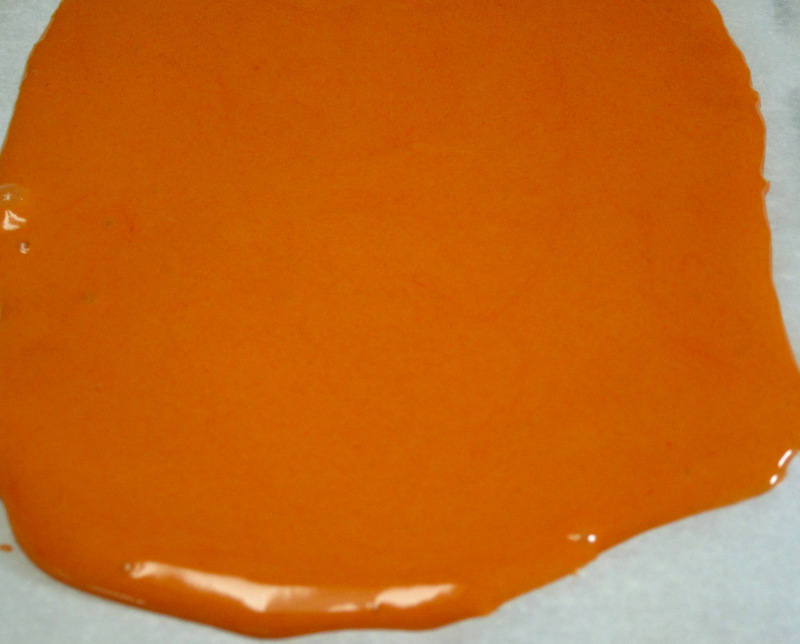 Carrot juice is mixed with sugar and Methocel F50 and cooled. 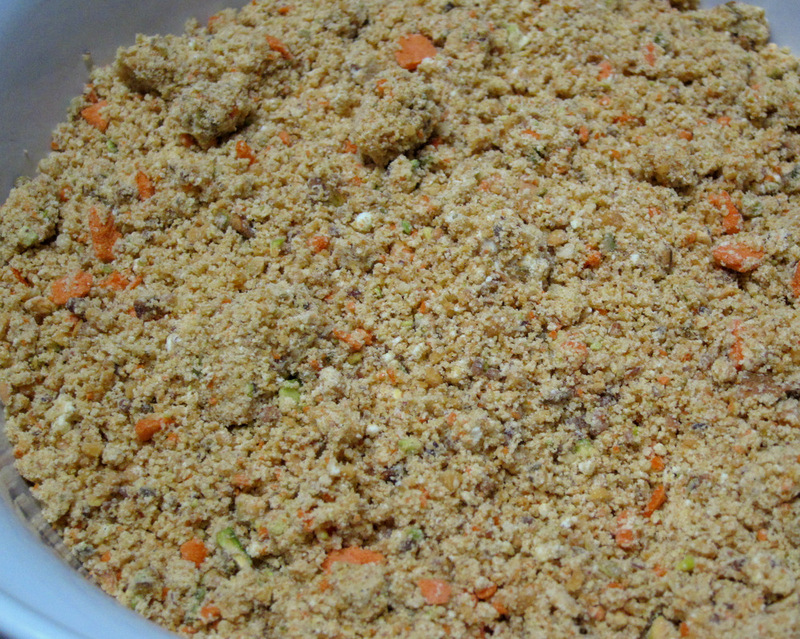 The mixture is then whipped to form a fluffy mixture very similar to a light mousse but has the pure flavor of carrots. Very tasty stuff. The mousse is spread on an acetate sheet and dehydrated for much longer than the recipe specifies until I got a cracker-crispy sheet of carrot mousse. To bring the crumble mixture together I mixed pistachio oil with N-Zorbit Tapioca Maltodextrin (I’ve mentioned this product that makes powders out of oils a few times before like here and here). 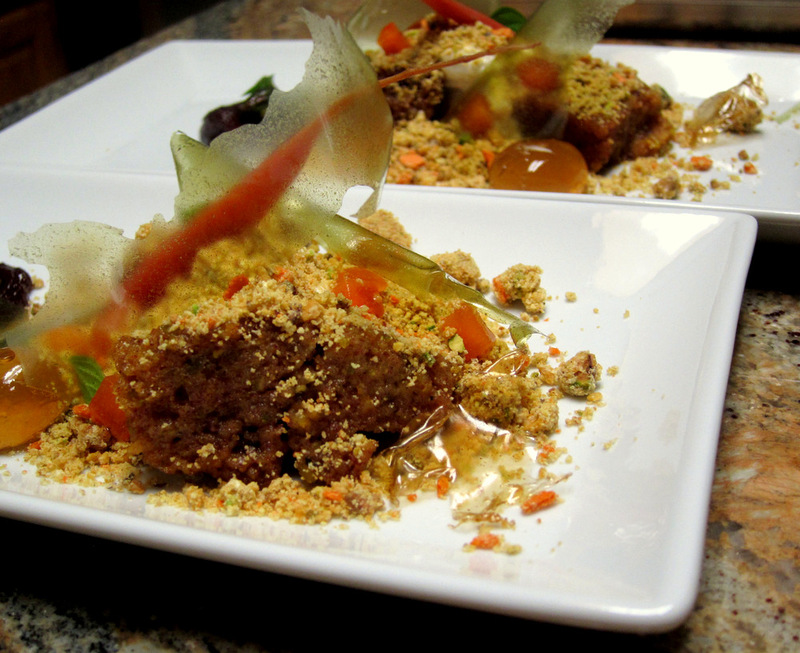 Then I added coarsely crumbled portions of the pistachio shortbread, pistachio brittle and the crispy carrot mousse. I reserved that in an airtight container until ready to serve. Speaking of reserving these various components for service I’ve always thought the book should do a better job informing us of the shelf-life or fridge stability of these various components. This is especially critical for someone like me who is making recipes like these over a period of weeks! I did find out that most of these items do last at least a few days if properly stored. 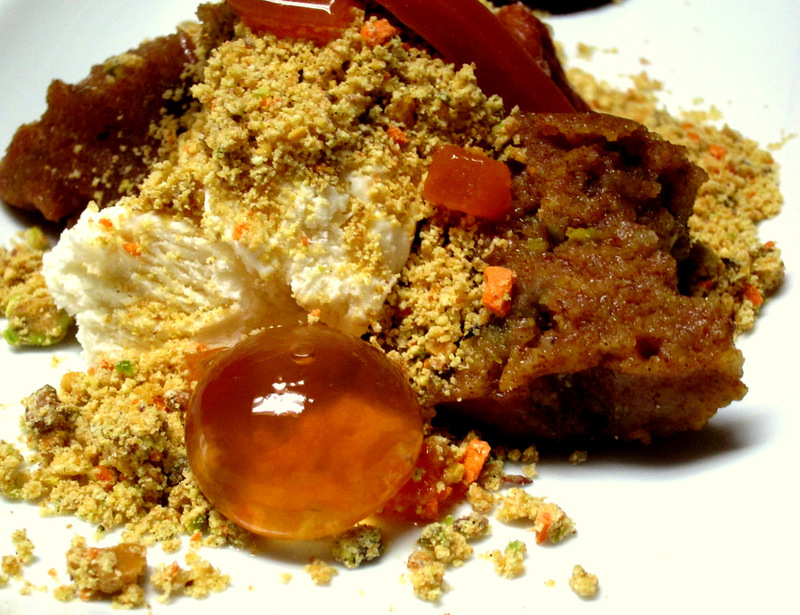 The crumble mixture in an airtight container was still perfectly fine a week or more after I originally served the dessert. A hydrocolloid that I have never worked with before and yet another reason I wanted to check out this recipe is Pure-Cote B790. The space-age name aside this is basically a modified corn starch that is used in small quantities to help in making really cool paper thin film. Think of those Listerine strips that melt on the tongue. Yeap, using Pure-Cote one could make these films flavored with anything. In this recipe it is used to make a spice aroma strip as well as a green tinted “glass” flavored with an herb called anise hyssop. 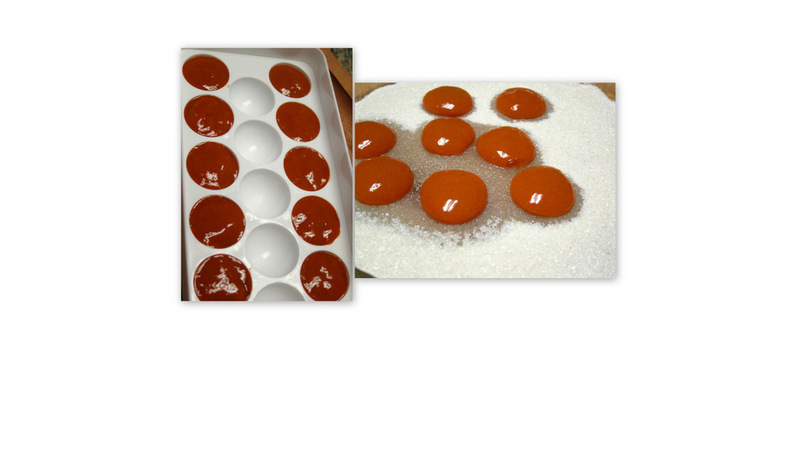 The process for both glass and spice strip is similar. Steep the flavor in a sugar water syrup and mix in the hydrocolloid. 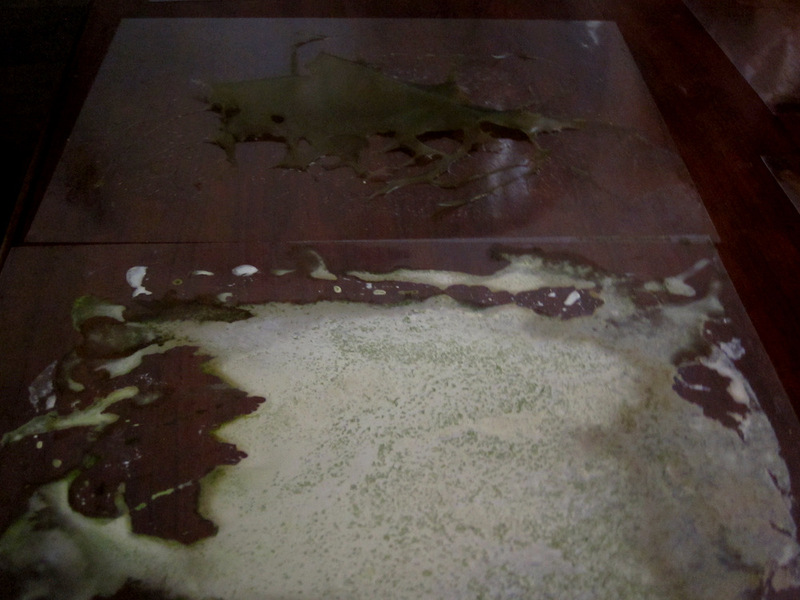 Allow that to dry out on acetate sheets overnight and peel off. In the case of the green glass a dehydration step follows making those films into amazingly brittle and fragile “glass”. The spice aroma strip is flavored with cloves, mace, nutmeg and allspice. The green glass is supposed to be flavored with anise hyssop but that is nowhere to be found. It is supposed to taste like a mixture of mint and anise, so what I did was use half mint and half fennel fronds. I think that worked great, had a lovely green tint and a nice burst of flavor. There has to be a typo in both of these components’ instructions in the book though. After mixing the Pure-Cote into the liquid base we are simply instructed to pour it in a thin layer on sheets. This does not work because the Pure-Cote is not hydrated or gelled! and what you end up with is a mixture that separates into starch and liquid like the mixture towards the front of this picture. 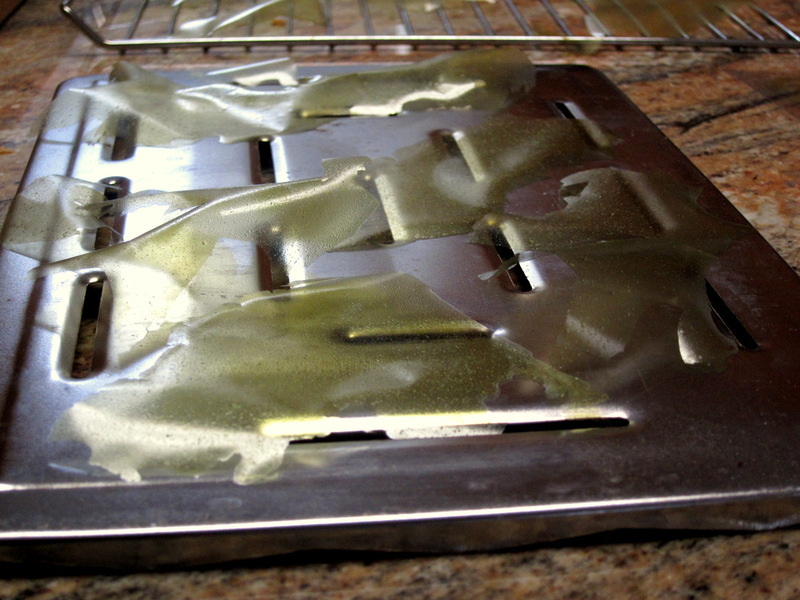 After doing some research and looking through my Modernist Cuisine books I confirmed my suspicion that indeed the Pure-Cote mixture needs to be heated up in order to gelatinize the starch. That worked much better (see the mixture towards the back in the above picture). Another reasoning for the book’s instructions might be that at Alinea they use a VitaMix blender and they whip the mixture for a long time at a very high speed which indeed heats it up and hydrates the starch. I do not have one of those yet so I will be gently warming my Pure-Cote mixtures to hydrate them. 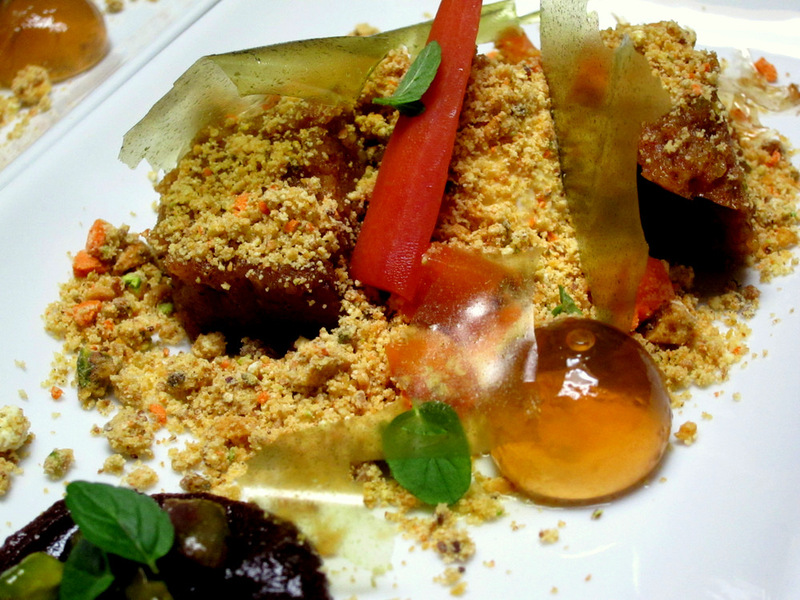 To emphasize the warm autumnal flavors and add punches of sweet and sour we have two sauces based on dried fruit. 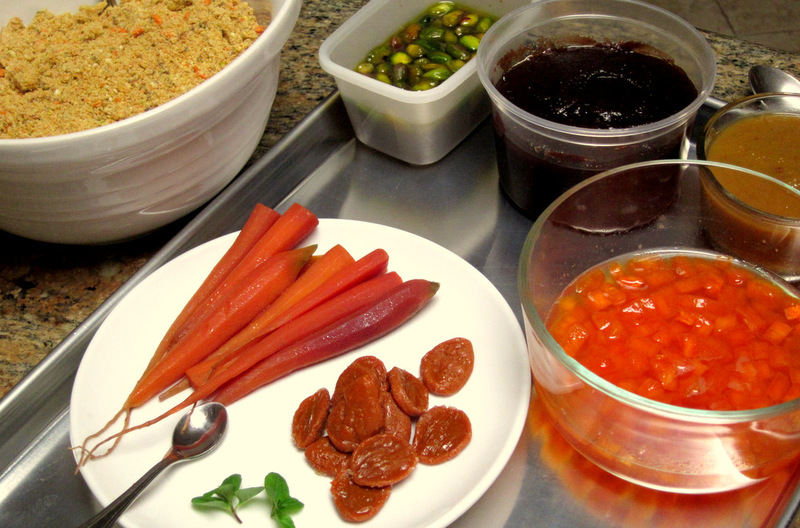 The first is a date puree made from softened dates and ruby Port. 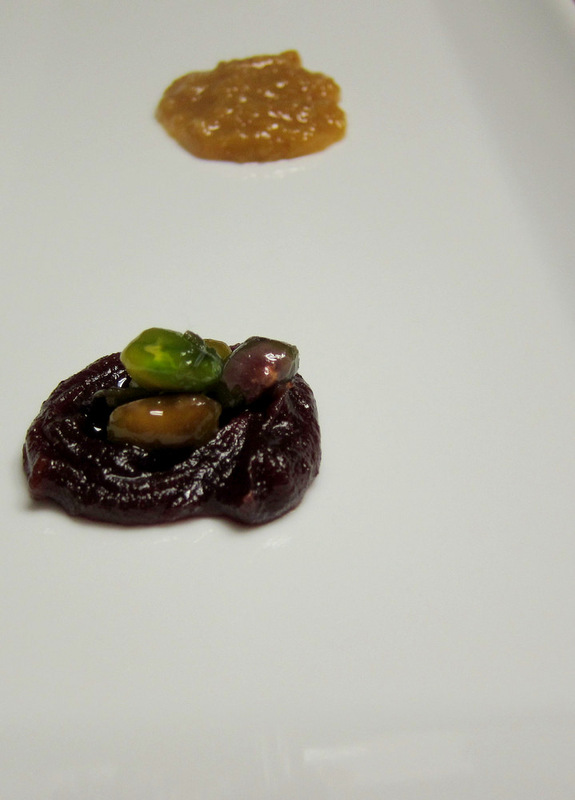 It is very sweet as expected and used very sparingly as a dollop to top with the braised pistachios. The other sauce is made from golden raisins and verjus, the mildly tart juice of the sour unripened grapes that works great as a gentle substitute to vinegar in dressings and sauces. Verjus has a fancy French name and is mostly associated with western cuisine but actually -in addition to pomegranate molasses (Dibs Ruman)- it is a traditional sour ingredient in Lebanese cuisine. Many families would make Houssrom, as it is known there, during the summer months when the vines are full of unripened grapes that needed to be culled. Spherification is something I’ve played with before here and a technique that produces an aesthetically pleasing product as well as a flavor burst. This recipe has two such preparations. The first is the straight-forward ginger sphere. This is a ginger infused sugar syrup that is blended with Calcium Lactate and frozen in small cubes. It is then dropped into an Alginate water bath to form perfect liquid orbs of sugary ginger encased with a thin film of itself. I reserved these guys in more of the ginger-sugar liquid in the fridge and they lasted perfectly for several days. 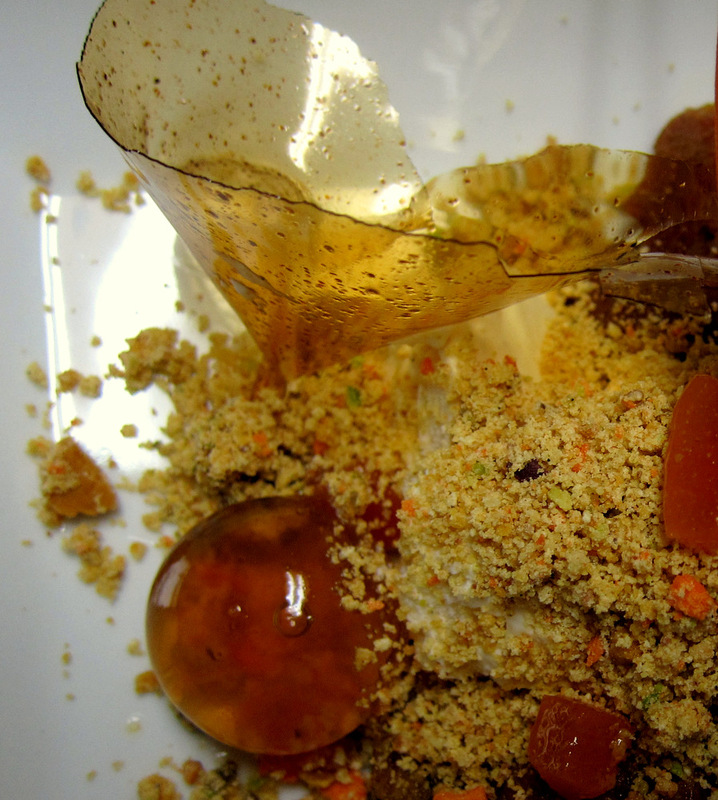 The second sphere is where the Alinea team take this preparation past the “cool trick” stage and transform it into something unique. Since the spheres are orbs of liquid (think grape) why not make raisins out of them? That’s what they do. So, I got carrot juice and blended in some sugar, a small amount of red Thai curry and Xanthan into it. Then I mixed the Calcium Lactate and froze the mixture in hemisphere ice cubes. After dropping those just like the ginger ones into an Alginate bath they went into a small pan covered with a layer of white sugar. More sugar went on top and the spheres were allowed to cure for an hour. During that time the sugar draws a lot of the moisture out of them and firms them up a bit. Lastly, the cured orbs were dehydrated in a very low oven until shriveled and wrinkly, just like raisins. They were delicious with a spice flavor and sweetness that worked great in this fall dish. Their interior was moist and jam-like. A few more items garnish the plate. One is cubes of Fuyu persimmon that are supposed to be marinated in a type of fortified wine called Pineau des Charentes. I had none and did not really want to seek it out. I decided to pick a liqueur that I think would work in the dish. 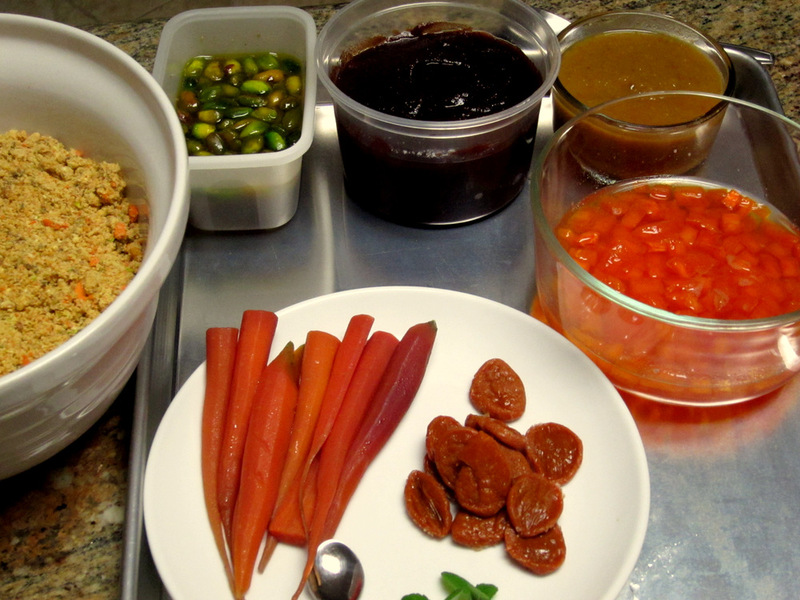 The crumble mixture is supposed to include a small proportion of honey granIules – another item I did not have. So, I decided to include the honey flavor in the marinated fruit. I vaccum marinated the cubed Fuyu in a Foodsaver canister with homemade honey liqueur instead of the Pineau des Charentes. That turned out well and the fruit gave a burst of sweet honey flavor to the plated dish. Another item was glazed baby carrots. 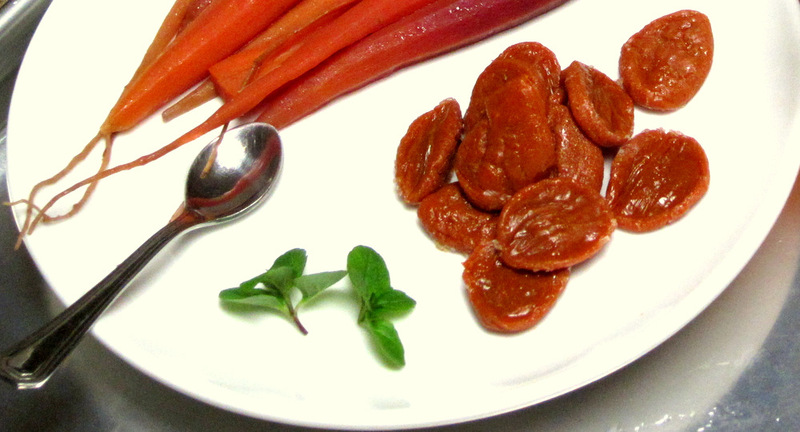 These were thin small sweet carrots, peeled and cooked sous vide with a pinch of sugar. 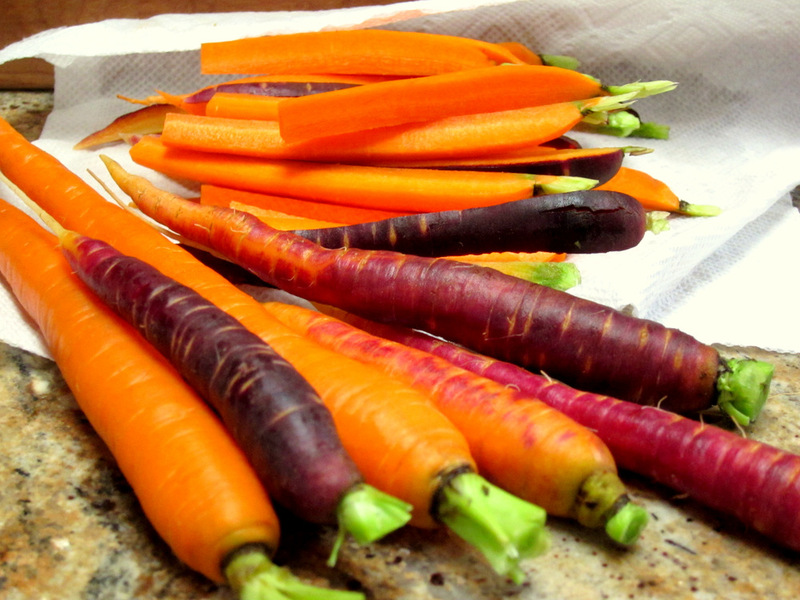 The carrots are warmed right before serving. 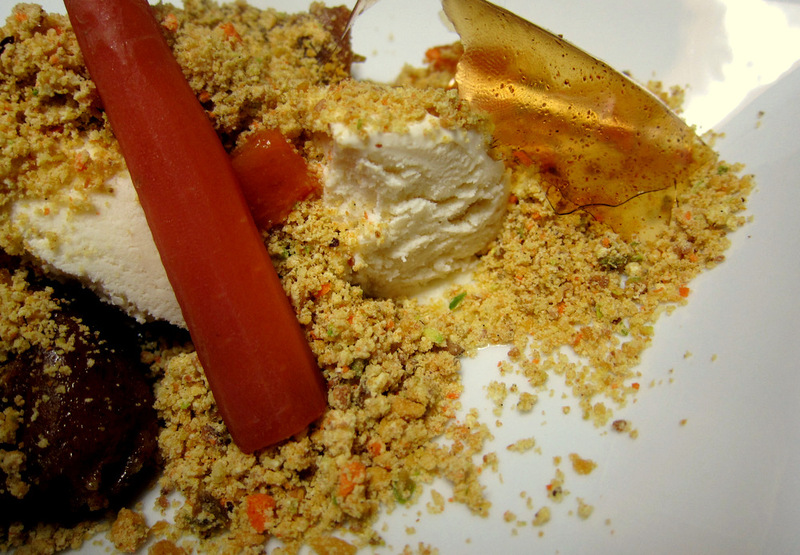 The dessert was a perfect fall-winter plate of sweetness with perfect textures and amazing flavors. I loved how the ice cream, very subtle and muted on it’s own, worked perfectly as a cool milky canvas for the strong flavors and textures in the composed dish. 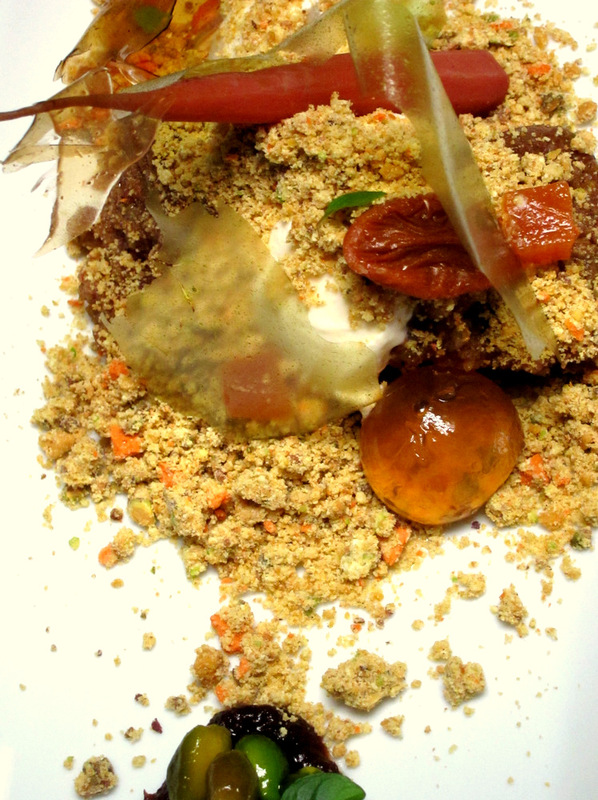 It really amazes me how the Alinea team pulls off multitudes of dishes like this during service night after night. Hopefully one day I’ll get to snag a table there and try it out for myself.